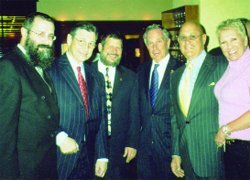 Mr. Les Turchin, for whom the Rutgers Chabad House is named, and a dear, personal friend of Rabbi Yosef Carlebach, Executive Director of the Rutgers Chabad House, passed away in January 2006 during a brief illness. 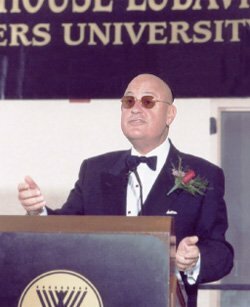 Les was a unique man who was powerfully committed to helping Jewish students. He was singularly devoted to ensuring that the Chabad House stood as a symbol of Jewish tradition, strength and relevance on campus. Harry Franco, the Mayor of Deal, NJ, who was very close with Les, remembers a unique man. “I don’t even know where to begin,” he says. “I was the one who introduced Les to Rabbi Carlebach almost fifteen years ago. Les was at a stage of his life where he just wanted to do something. He wasn’t a particularly religious man, but I know he recognized that it was time to help. 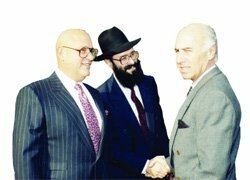 Back then I told Les that he had to meet this guy Rabbi Carlebach who was doing great things for Jewish students. At first he just didn’t want to commit and actually made his first contribution on the condition that Rabbi Carlebach stop calling him. “But look at what happened. The role he’s played in Chabad, I mean, he and Rabbi Carlebach became best of friends, what does that say? I know Les would call Rabbi Carlebach every single day. He just trusted Rabbi Carlebach and he wanted the kids to be comfortable and safe and to be exposed to their Jewish heritage and tradition in ways he was never able. He was just that kind of guy; he had a heart of gold and if there was something he wanted to do, he would get it done, no matter what. Rabbi Yosef Carlebach recalls that upon meeting Les, he had “a spiritual energy that even he had yet to discover.” As Les began to discover this spiritual energy, he also began to discover his personal connection to Judaism. “I know Les put on tefillin every morning. He looked for ways to inject Yiddishkeit into his daily life. “We spoke very often. Les was just a different type of person. He went about doing things differently, but he realized the need to magnify the cause of Jewish kids. He seemed to feel that it was time to do some good with what he had; that it was time for him to get involved. For the last number of years, Les and I would speak every single day. “Les was one of the first people to throw his support behind the new building, to stand up in a significant way. Because of his strong statement, many other donors decided to come on board. I’ll always remember Les as a leader. Why? What makes a leader the leader? That he stands out among others. “Les was the first one who stood up for Chabad. And he did this at a time when Chabad at Rutgers was not a household name. He did it before the success and before the high profile. We did not have a track record of ten institutions and a multimillion dollar budget. He told me that when he pledged his first million-dollar donation, he was ridiculed. To Watch the Les Turchin Video click here. Outspoken about anything and everything Chabad, Turchin, who candidly speaks about his earliest involvement with Rabbi Carlebach and the nature of his developing relationship with Chabad House, admits that at first he was reluctant to allow Rabbi Carlebach into his life, much less make a serious financial commitment. Turchin eventually agreed to meet upon the recommendation of a close mutual friend, Harry Franco, Mayor of Deal, New Jersey. In the eleven years since Les Turchin first met with Rabbi Carlebach, their friendship has grown steadily. 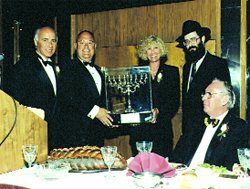 So has Les’ connection and involvement with Chabad House. As Rabbi Carlebach recalls, he recognized something special about Turchin-a spiritual energy he sensed Les had yet to discover within himself. Rabbi Carlebach, describing Les, expresses his admiration for a man who has become nothing less than a foundation for the organization. “Les is a phenomenal individual and a true friend of mine. I can’t imagine my life without him.” What is very impressive to Rabbi Carlebach is the genuine love that accompanies Les’ support. “Aside from the fact that without Les, our new Chabad House never would have become a reality, I love to see the enjoyment Les experiences when he helps Chabad House. Les was one of the first people to throw his support behind the new building-and because of him many other donors decided to come on board.